Robotic carts such as Chuck can improve the efficiency of human pickers, combining the order management with the flexibility of human associates, say 6 River Systems executives. Most warehouse and e-commerce order-fulfillment operations are still manual, so the potential market for mobile robots is huge. As significant as the technical challenges are, the bigger barrier to widespread adoption is educating potential users. 6 River Systems Inc.’s ‘Chuck’ robots are an example of robotic carts that can help warehouses improve productivity. The global mobile robot market will have a compound annual growth rate (CAGR) of 16.31% to reach $10 billion by 2020, estimates Markets and Markets. In another bullish forecast, Transparency Market Research predicts the mobile robot market will grow from $8.5 billion in 2016 to $30 billion by 2025, with a CAGR of 15.6%. In the video above, Ryan Hamilton, co-founder of 6 River Systems, notes that about 70% of the warehouse operations he has encountered are still manual. He says that more affordable sensors, better on-board processors, and the support of the open-source software community have contributed to the success of robotic carts such as Chuck. Both Hamilton and co-CEO Jerome Dubois came out of Kiva Systems, which was acquired by Amazon in 2012 and renamed Amazon Robotics. In 2015, Hamilton, Dubois, and Christopher Cacioppo (now chief technology officer) founded 6 River Systems. Robotics Business Review recently visited 6 River Systems in Waltham, Mass., and learned how Chuck works. The robotic carts are nicknamed after the Boston area’s Charles River. 6 River Systems is named after the tributaries in the Charles River watershed. Chuck uses lidar from SICK and two Intel RealSense cameras for localization and navigation. No additional infrastructure is required, and the robots are wirelessly connected to the cloud. Chuck’s software is based on the Robot Operating System (ROS), and it can be integrated with a variety of warehouse management systems in days. At the induct station, a human picker badges in and scans in a printed barcode for order information. Chuck’s user interface consists of a touchscreen and rugged buttons on the robotic carts. The robotic carts themselves come in two sizes — 24 and 30 in. wide — with the ability to stack boxes or totes to a payload capacity of 160 lbs. Chuck’s design also includes “headlights” and “taillights” so human co-workers can immediately tell what direction it’s moving. It also beeps as it backs up and slows down at blind corners. “The form factor is a drop and replace for carts,” said Hamilton. Unlike some goods-to-person solutions like Kiva, the robotic carts safely meet and lead associates to orders. 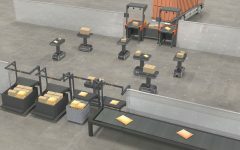 As human associates pull items from shelves, scan them, and place them on Chuck, the cloud-based software can sort exceptions and optimize operations as the robotic cart takes off to its next stop. The typical ratio is 1.5 robots per worker. As part of this directed workflow, machine learning can help increase utilization and reduce walking, said Cacioppo. “With lots of orders coming in, we can see how the robots perform from day to day,” he said. Chuck costs half as much as other robotic conveyors, and the robotic carts can double or triple productivity, said Hamilton. The company provides the “full stack — hardware, software, support, and account management,” he said. After recently receiving $25 million in Series B funding, 6 River Systems is growing from its current staff of 80 people, half of whom are in engineering. The company is also working on multi-mode pick strategies and dashboard displays. While mobile robots include autonomous forklifts, shelf-moving systems like Kiva’s, and devices for other markets, 6 River Systems is keeping its focus on e-commerce fulfillment. Ten customer sites currently have about 100 robots, and 6 River Systems expects to have 30 sites with more than 600 robots by year’s end. Note: Editor Keith Shaw contributed to this article.